How to search my scans with their content? By default, the search field in Genius Scan only searches in the title and tags of your documents. However, with Text Recognition you can find documents based on any of their content. 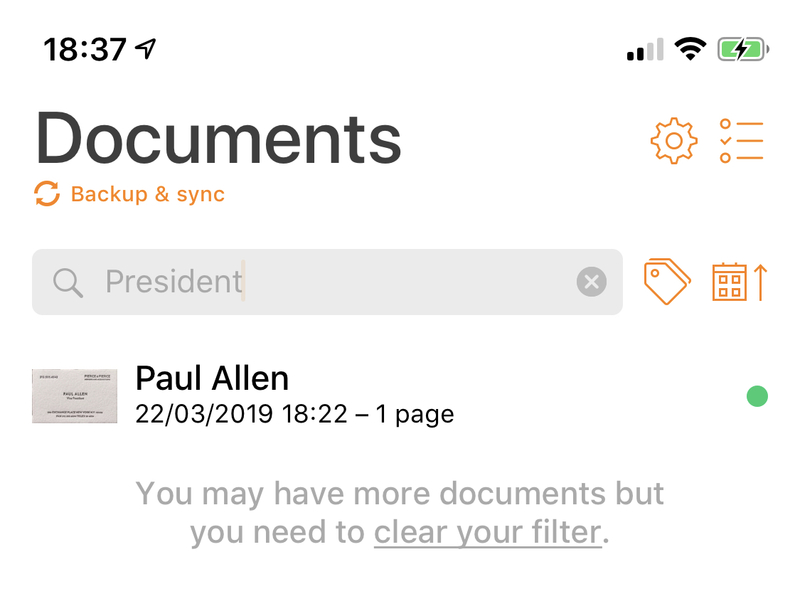 This will let you quickly find an old iPhone receipt by searching for "Apple Store" even if the text doesn't appear in the title of the document but only in the actual document. Make sure Text Recognition is activated. Make sure the document has been processed with Text Recognition. By default, OCR will only apply to new documents. You can go in the settings of Genius Scan to process old documents. Search your document based on its content. For instance, in the following examples the document will match because the business card contains the text "Vice President". Can Genius Scan recognize the text in my scans? How can I get a searchable PDF?